Why is the Province of Toulouse celebrating already in 2015? Although the Jubilee of the Order of Preachers is not yet officially launched, in the South West of France in the Province of Toulouse celebrations are already well underway and the month of May has a particularly heavy schedule of events. It is not just that the friars here are impatient to start the festivities before everybody else, there are indeed sound historical reasons. This year the feast of the translation of St Dominic’s relics coincides with Pentecost weekend, in the very month that marks the 800th anniversary of the beginnings of the first community of Preachers in Toulouse. It is important to remember that before the Order of Preachers was instituted for the universal Church by Pope Honorius III, there was a diocesan institute of preachers set up at the initiative of Foulque, Bishop of Toulouse with Dominic at its head. The official mission of these new preachers was “to eradicate heresy, eliminate vice, teach the rule of faith and inculcate sound morals.” This happened in May 1215, thus the current celebrations are most timely. In fact, Dominic was becoming progressively more integrated into the diocesan Church of Toulouse, since his presumed return from Spain in 1211. Although his immediate priority at this point was to help the still sprouting monastic community at Prouilhe, for it was not until 1211-1212 that proper buildings were erected for the sisters, allowing all the nuns to be housed together in one place. In 1214 Dominic held charge of the Christian community in Fanjeaux, and so in that sense he was the parish priest. At the end of this same year, there is evidence of Dominic in Toulouse as praedicationis minister. Around this same period, he was elected Bishop of Couserans, but declined to take up the post. In January 1215 however, events took a different turn. Dominic received the gift of some properties in Toulouse, which made the setting up of a community of preachers a distinct possibility. The donor was Pierre Seilhan, well known to us through the still surviving “Maison Pierre Seilhan” in the Place du Parlement at Toulouse. The transfer of the property was finalised on April 25th 1215, when the Seilhan inheritance was settled and property shared between the two brothers. In May Bishop Foulque formalised the arrangement, making Dominic’s community a permanent diocesan institution. 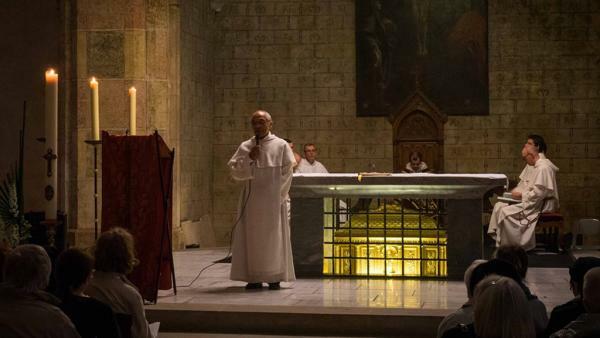 For the celebration of their Jubilee, the Province of Toulouse had series of events; exhibitions, concerts etc., and the grand celebration was held on Pentecost Sunday (May 24) at the Convent Church of St. Thomas Aquinas in Toulouse. These activities were well publicized on the web and on social media. They also launched a website on the history of the Order.